Texas Hires Coach Charlie Strong, And History Is Close At Hand : The Two-Way As he moves from Louisville to Austin, Strong becomes the first black coach of a men's team at Texas. For some, his hiring brings to mind how things have changed at a school that, during the 1960s, fielded teams made up of only white players. Incoming Texas Longhorns football coach Charlie Strong is embraced by Edith Royal, widow of famed Texas coach Darrell Royal, Monday. The University of Texas introduced Charlie Strong as the school's new head football coach Monday, hoping to usher in a new winning era by hiring a man known for strong recruiting and stubborn defenses. As he moves from Louisville to Austin, Strong becomes the first black coach of a men's team at Texas. For some, his hiring brings to mind how things have changed at a school that, during the 1960s, fielded teams made up of only white players. 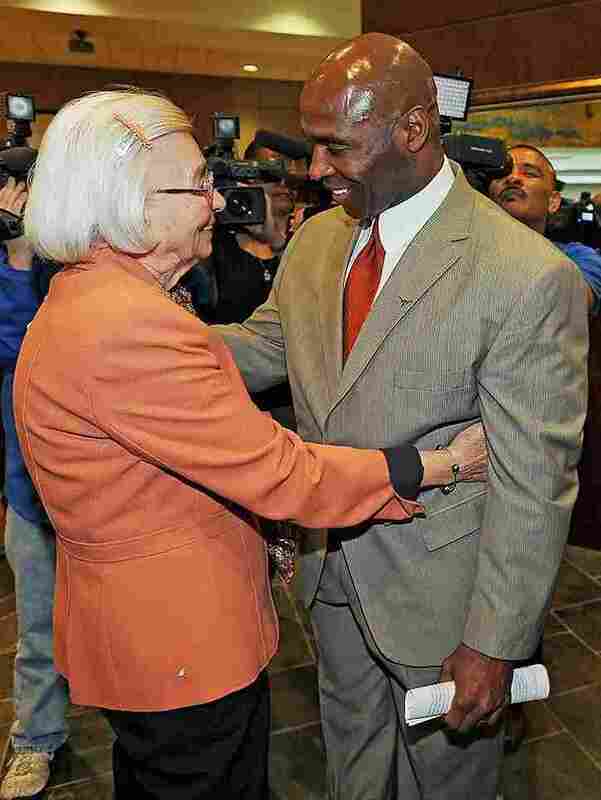 "New Texas football coach Charlie Strong with Edith Royal, wife of former coaching legend Darrell Royal. "Royal's 1969 team was the final all-white national champion in college football. "While Strong was considering Texas' offer, Edith Royal spoke to him by phone and urged him to come to Texas." As an article in the school's Daily Texan tells us, coach Royal had been working to integrate his team even before his final all-white team won the national title. An ESPN story written after Royal's death in 2012 lays out some of that complicated history. The Longhorns squad was finally integrated when Julius Whittier played for the team in 1970 — a year capped by a share of yet another national title. Royal's later recruits to the school included star running backs Roosevelt Leaks and Earl Campbell. As Charlie Strong was introduced on Monday, the Longhorns' football stadium devoted its scoreboard to a huge image showing the new coach and the tagline "Texas Strong." It appeared just beneath the stadium's official name: Darrell K. Royal - Texas Memorial Stadium.